New Apple service spare superdrive plus mounting bezel for the 2.0GHz and 2.66GHz 2009 models of 20" Aluminium iMac. 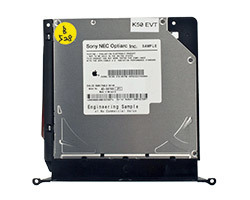 This is an exchange product which means that the old optical drive and bezel must be sent to us first and must not have been physically damaged or damaged by a liquid spill. Note that the replacement unit may not be the actual optical drive model shown as Apple use equivalent drives from various manufacturers within the same product range but since the drive comes with it's bezel, the units are fully compatible and interchangeable.